Pomegranate supports healthy blood flow. In a group of aging humans with risk factors for cardiovascular events, pomegranate or placebo was ingested on a daily basis. After 12 months, the mean intima media thickness improved 35% in the pomegranate group, whereas carotid blood flow worsened by 9% in the placebo group. Both groups continued taking conventionally prescribed medications. In another study on patients with ischemic coronary heart disease, pomegranate or placebo was ingested daily. After only three months, coronary artery blood flow improved by 17% in the pomegranate group, butworsened by 18% in the placebo group. Few nutritional sources have gained as much scientific validation as pomegranate. Until now the vast majority of research has focused on extracts from the fruit. Only recently have scientists identified the synergistic action of compounds specific to other parts of the pomegranate — most notably its seeds andflowers. 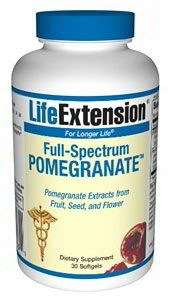 Life Extension introduces Full-Spectrum Pomegranate which combines standardized extracts from thewhole fruit and flower, along with pomegranate seed oil, to support system-wide health. In addition to the highly absorbable antioxidant powerhouses found in pomegranate fruit — Full-Spectrum Pomegranate augments these polyphenols with newly discovered biologically active compounds from other parts of the pomegranate plant. These little-known nutrients include: punicanolic acid, a member of the triterpene family of essential oils that provides cellular support to help with inflammation; and a polyphenol compound calledpomegranatate, to combat age-related metabolic changes. This superior formula supplies the complete nutritional profile of the entire pomegranate plant. Just one softgel of Full-Spectrum Pomegranate provides polyphenols equivalent to 12.3 ounces of pomegranate juice concentrate (or 30 pomegranates) plus a proprietary blend of seed oil and flower extract. Other ingredients: soybean oil, gelatin, glycerin, beeswax, purified water, phosphatidylcholine, caramel color.